Polarized sunglasses are sunglasses that have a polarizing film that is applied to the lenses to help reduce any type of glare. The glare is created when light bounces off of surfaces such as buildings and water. When buying women's polarized sunglasses, put good eye protection and comfort ahead of style and price. This will most likely mean going for a more sporty type of glasses rather than a street style fashion. However, polarized sunglasses were developed specifically for outdoor activities such as volleyball, swimming, fishing and hiking. This being the case, street style fashion should not be your highest priority. A good pair of polarized sunglasses will be made of durable yet flexible plastic, and the lens will be impact resistant. Polarized sunglasses will be lighter than your normal pair of sunglasses because they are meant to be worn all day and need to be comfortable. They will offer a good fit that does not slip around the sides of your head. When buying polarized sunglasses, consumers often overlook the quality of the glasses they are buying. It is possible to find an inexpensive pair of decent, stylish sunglasses, but price often speaks volumes when it comes to quality. More than likely you will be buying another pair in a month or so. The money adds up quickly, and soon you could have bought a pair of true quality polarized sunglasses that offer personalized fit for the same price as several pairs of lower quality sunglasses. Begin your search on the Internet. Look for reviews and discussions as to what others have bought and where. Many times they will mention how much they paid. Use this as a benchmark. If a brand name is not on your list of high priorities, then OC Shades offers the best deals on the net. OC shades provides cheap shipping and has a no hassle money back guarantee. For the best deals in brand names such as Ray Ban and Oakley, it is recommended that you visit your local retailer and get a precise fit for comfort. One such retailer is The Sunglass Hut. Oakley sunglasses and Ray Ban sunglasses offer superior quality and wear along with multiple options on each of their products. If buying polarized sunglasses online from retailers such as OC Shades, expect to pay between $10 and $15 for an average pair as of Sept. 2010. 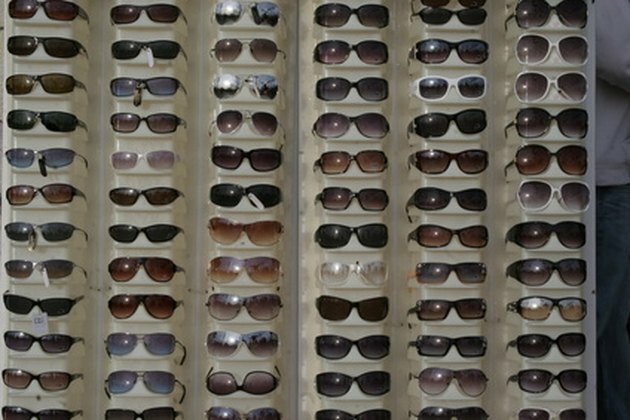 Name-brand polarized sunglasses such as Oakley or Ray Ban are going to cost more. However, you do get what you pay for. Oakley and Ray Ban, as well as other top-of-the-line developers, spend millions of dollars on research. These retailers have to stand behind their product, and there is quite a lot of competition. These popular brands range in price between $150 and $200. All sunglasses help to reduce light and glare. The difference with polarized sunglasses is that these lenses reduce selective glare depending on which angle the glasses are pointed. All other sunglasses reduce glare on everything by the same amount. This means that if you are looking at the ocean through a pair of normal sunglasses the whole ocean will be darkened to reduce glare. With polarized glasses, you will be able to see the rocks and the fish under the water. If you are looking for a good case to protect your sunglasses, it is best to shop for a hard shell case that is lined with soft cloth. These cases are bulkier then the average soft leather case. However, a hard shell case will help to keep the glasses from breaking or getting scratched if dropped or stepped on. Make sure to shop around before buying, because prices can vary from store to store, depending on the vendor. Also check online or ask about any coupons or discounts. These are often available but not advertised.